The Working Group Association is headquartered in Berlin. In order to carry out its tasks and manage the business of the association, a liaison office (European Representation) was set up in Brussels in 1993. The Brussels office consists of seven employees. 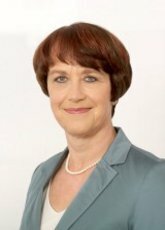 The members of the Working Group Association are the federal umbrella associations of the German social insurance system consisting of statutory pension insurance, statutory accident insurance, statutory health and long-term care insurance, and the federal associations of the health and long-term care insurance. The bodies of the Association are the Annual General Meeting and the European Coordinating Committee (EKA). determining the tasks of the Association in terms of its intended purpose. The European Coordinating Committee (EKA) acts as the Association’s board. Each area of social insurance designates one executive director or board member as a full member of the Coordinating Committee. Chairmanship alternates between the chair and the first and second deputy chairs on 1 July each year. 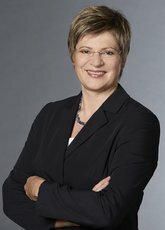 The Coordinating Committee appoints the Director and Deputy Director of the European Representation of the German Social Insurance in Brussels. In addition, it adopts guidelines for how the Director is to manage day-to-day business and it arranges the Annual General Meeting for the Director. The EKA can form working groups with employees from the members of the Association and the liaison office. 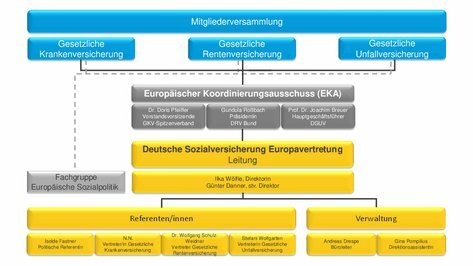 One permanent working group is the Expert Group for European Social Policy (FGES) which assists the Coordinating Committee with substantiating the position held by the German Social Insurance on European policy.